The backup copy. If there ever was a picture of Carol the Meadow Lark on the cover of the Family Heirloom, it's long gone now. 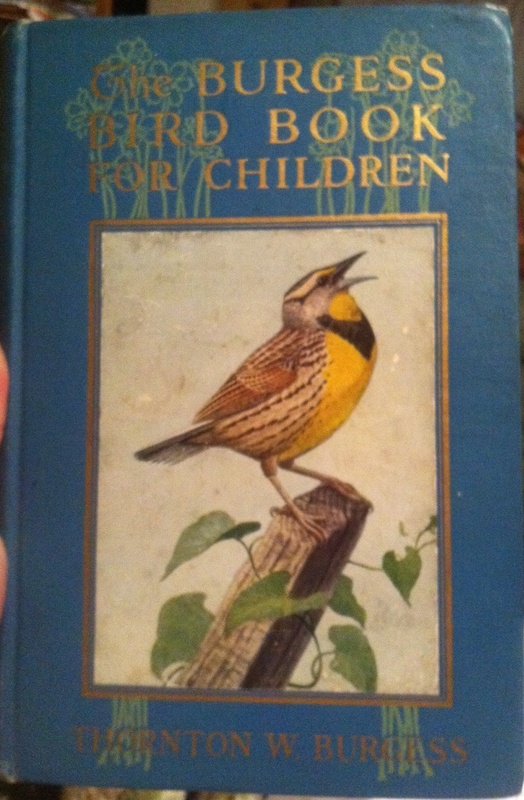 My favorite book as a child was without a doubt the Burgess Bird Book for Children. I read my copy of it so many times I wore out the spine. I dearly loved Jenny Wren, Sweet Voice the Vesper Sparrow, and Longbill the Woodcock, and looked for them everywhere as a child. Sadly my understanding of migration patterns and setting was, ahem, underdeveloped. Jenny, Sweet Voice, and Longbill visit the Old Orchard and the Green Forest in summer, so that’s when I looked for them. Unfortunately I failed to realize that the Old Orchard and the Green Forest are in Massachusetts, and that when Jenny talked of flying South for the winter, she was talking about going to my neighborhood in Texas. I needed to be looking for those birds in winter, not summer. Which sort of explains why I never saw any of them except for Sally Sly the Cowbird and Blacky the Crow. Still, I love this book. So after learning that I was pregnant some years ago, I immediately hunted down my old copy. When I saw its tattered condition (the cover on the spine is literally hanging by a thread), I ordered a backup copy from Amazon from roughly the same era. My initial plan was to let the backup copy take the abuse of repeated mother-daughter readings, then once she was well and truly hooked, show The Four-Year-Old the original Family Heirloom. At least, that was the plan. Naturally, The Four-Year-Old much prefers to read the actual book I read as a child, so the backup copy’s most onerous task to date has been to pose for this post. Reading the book to my daughter has reminded me of how much fun this book is to read. It’s packed with information about the birds of our area–what they look like, what they eat, where and how they build their nests, and how they care for their children–but unlike other packed-with-real-information books it’s not boring. Peter asks the same type of questions The Four-Year-Old would, and Jenny is such a snippy old gossip the learning ends up being quite easy on the mind. It’s fun too to be finally reading this book in the part of the country where the events take place. Not that geographic location is at all required to enjoy the story. I loved this book long before I ever considered moving to Massachusetts. But it is nice to be able to make the story more real for The Four-Year-Old by reminding her of the time we spotted Downy the Woodpecker at Moose Hill. My one complaint about this book is that it doesn’t include illustrations of every bird it mentions. I know, I know, the cost of doing that back in 1919 when it was first published was probably prohibitive. But it can be difficult to picture a bird from a verbal description alone. 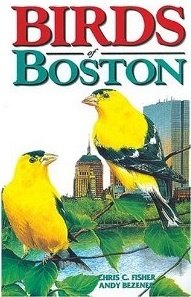 So if you do decide to read this book, it’s a good idea to have a copy of Birds of Boston (or your preferred field guide to North American birds) handy as well, so that you can show your child pictures of the birds that didn’t rate their own illustrations as they come up in the story. A final note on acquiring this book. Many of the newer editions have black-and-white versions of the original illustrations. If you want your child to be able to spot these birds in the wild, it’s worth it to hunt down a copy that presents those illustrations in color. If you can’t find one for a reasonable price though, pairing a black and white edition with a color field guide from your local library should do the trick. And now it’s your turn. What are you reading this week?